This passionate woman, who brings animals brilliantly to life for her audience, was born in Spokane Washington and now resides in Ovando, Montana. Diane has been in love with animals since early childhood. She studied Business in College, all the while yearning for the outdoors and oil paints. After working “regular jobs” for several years, she finally jumped back into painting animals and the beauty around her. Diane loves to travel. When she travels, she is off to Montana or Wyoming most frequently. She travels with her pop up camper, visiting State Parks to take images of wild life that she so loves to paint. 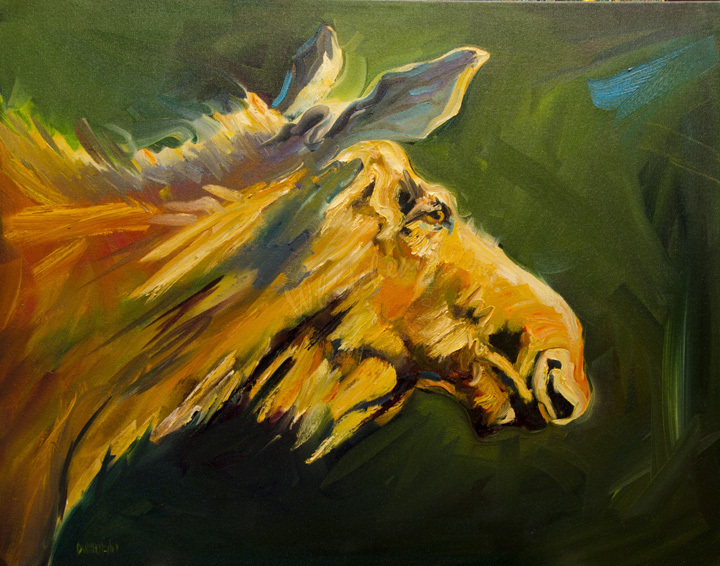 She is highly praised for her strong brushstrokes and bold use of color; both of which make her work come alive Diane shares her talent to help animals by donating her work for animal charity functions in and around Park City. Animals are my muse. The scratch of the paw, pounce of a hoof, gesture of the head, alert ear, quiet stride, powerful shape, ancient wisdom. All come to play with the shapes I see as I paint. I am drawn to the natural beauty and coloring of an animal and am aware of how it must adapt to it’s surroundings, to become invisible to the hunter, visible to the same species to mate, and powerful enough to scare off predators. The bold color I see is like an animal aura, with such energy and emotion, it is difficult for me to ever tone down my color palette. I lived most of my life in Spokane Washington. I was raised the second of 8 children in a loving supportive environment - a little noisy at times, and most times I miss that noise. I currently live in Ovando, Montana and travel quite frequently to wild and western states. One of my favorite places is String Lake, in Teton National Park, Wyoming. Click here to shop for art by Diane.